When foreigners think of the Middle East they tend to think of sand dunes and camels. The reality is that the Middle East is a sprawling region with a landmass that is 90 per cent the size of the US and a larger, younger population of 351 million, compared to the 319 million people living in the US. When you look at the Middle East from this perspective, its business jet fleet, which represents less than 3 per cent of the world’s total, suddenly looks rather underwhelming. According to Jetnet, a provider of business aircraft market research, there are 575 business jets based in the Middle East. Bombardier expects 380 more new deliveries by 2023, where as North America’s fleet is expected to swell to 12,430 with 4,885 new deliveries in the same period. Beyond geopolitical problems, a reason for this comparatively muted growth could be explained by the fact that the Middle East was the only region this year where the number of billionaires actually dropped – from 84 to 66 – despite a global increase of 15 per cent, according to Bombardier. The perception of Middle Eastern business aviation is that it is very much driven by ultra-long-range aircraft and lavishly-configured bizliners – and there is some truth in this. Heavy jets account for over 70 per cent of the Middle East fleet, and large jets account for 24 per cent of the deliveries predicted by Bombardier over the next 10 years. Looking at Jetnet’s data in more detail, the combined Airbus and Boeing fleet makes up 24 per cent of the region’s total fleet. Whereas the Cessna Citation Excel is the best-selling business jet series worldwide, the most popular aircraft in the Middle East is the larger Bombardier Challenger 605, closely following by the Boeing BBJ1. There is also a perception that aircraft buyers in the Middle East are driven by more superficial motivations, with corporate jets used as status symbols rather than business tools. An ACJ319 (A6-CJE) operated by Emirates. However, as the market matures, buyers are becoming savvier. Dassault sees huge potential for its Falcon jets in the Middle East, where the regions accounts for 20 per cent of Falcon 5X sales globally. With a higher demand for new aircraft, the pre-owned aircraft market has suffered. Aircraft in the Middle East spend an average of 582 days on the market, which is considerably more than the global average of 391 days last year. It is not only bizliner sales that are dragging. Globally, the Gulfstream G550 inventory almost doubled in the first half of the year and it continues to cause headaches for aircraft brokers. 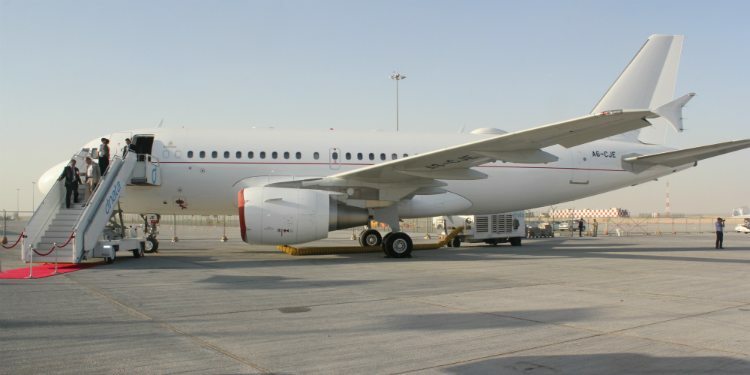 Brokers have also struggled to shift Bombardier jets as quickly in the Middle East – as well as other regions – where more than 14 per cent of the Global 5000 fleet is listed for sale, according to Plumb. “Roughly, two Global XRS aircraft are selling a month; unless you’re pricing to be one of those two, you’re not going to sell,” says Plumb. Some people have speculated that the reason behind the slow sales process in the Middle East could be cultural rather than economic, with Bombardier’s Saheb claiming Middle Eastern aircraft owners are “never happy with the trade-in price” offered to them.